In this FreeCAD tutorial for 3D printing, you’ll learn how to create your first 3D print model. No CAD or 3D printing experience required. Welcome to All3DP’s FreeCAD Tutorial for 3D Printing. 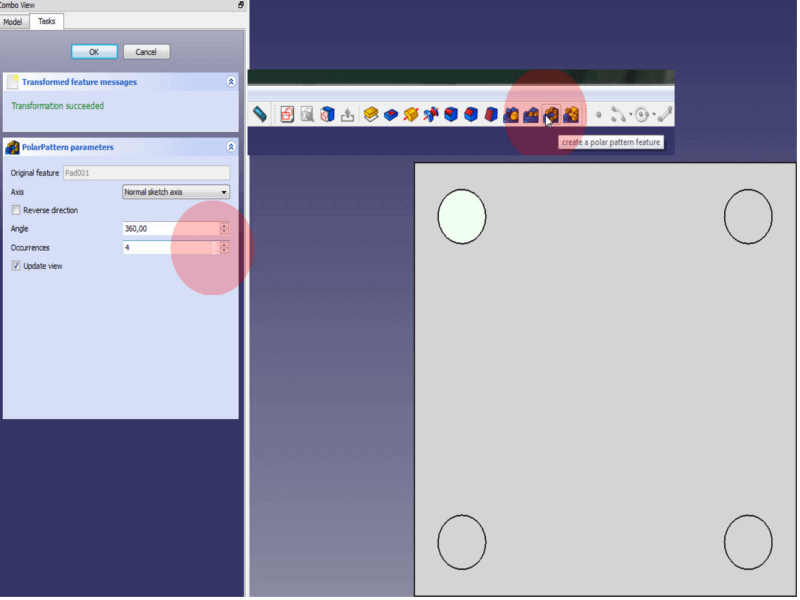 In this 5-lesson FreeCAD tutorial, you will learn the basic commands and tools to visualize your ideas on screen for 3D printing. We will construct a seemingly simple object – step by step. This FreeCAD tutorial gives you all the know-how you need to construct your own 3D print models. In the first lesson of this FreeCAD tutorial, you are going to learn the basics to handle the program. To do so, you need to download and install FreeCAD first. You can download it from their website https://www.freecadweb.org/ for free. Before you start with a project you will have to decide what units you are going to use. In this FreeCAD tutorial we are going to work by using the metric system. If the Combo View window on the left is already open you can skip the next step. This window is very useful to issue commands quickly. It also contains the Tree and Property view which allows you to have a closer look on the structure of your project. To build a three-dimensional object you will first have to sketch a base. 1. Change your Workbox from Start to Part Design. This will enable the option Create Sketch under the Task slide in our combo view window. 2. Click on Create Sketch. This will pop up a new window to choose the orientation to sketch on. First change your Workbox to Part Design. Then click on Create Sketch. 3. Now choose the XY-Plane, uncheck reverse direction and zero the offset. In this window the cube on the right will show you the selected plane. The Reverse Direction option will switch to the opposite plane. With the option Offset you can change the height of the plane. Press OK to proceed. 4. Under the Tasks bar new options popped up. Here we can change the Grids properties. Check all the grid options and set the Grid size to10mm. Unchecking Show grid will hide the grid and Grid size will vary the spacing of the grid. Selecting Grid Snap will automatically snap a point to the closest crossing. 5. 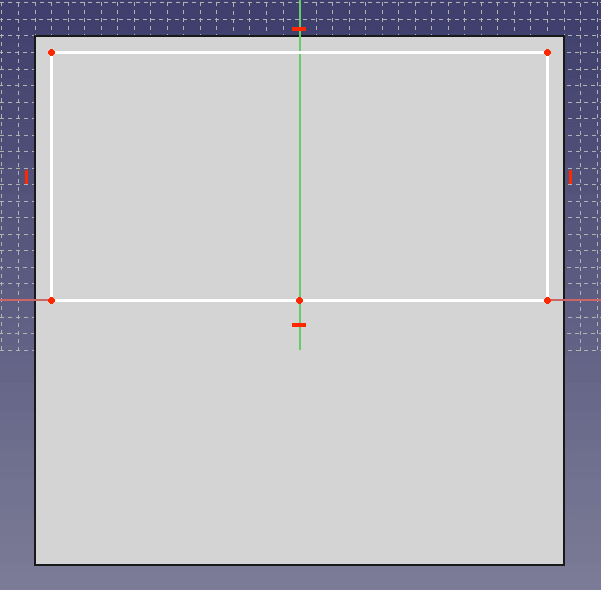 Select the sketch tool Create a Rectangle. When you move your courser over the coordinate system you can see the current coordinates right next to your courser. Click in the IV section of the coordinate system on the point -40.0, 40.0. You can also notice how the points snap to the grid which lets you work more precise. Make your rectangle 80.0 x 80.0big. 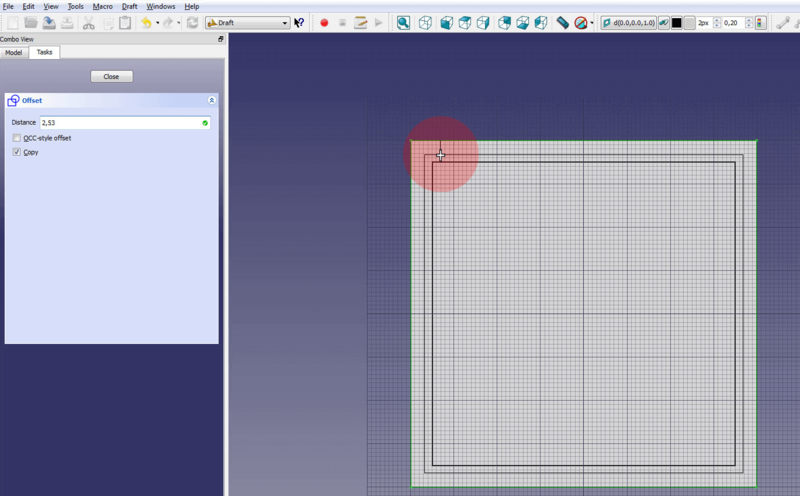 FreeCAD automatically sets constrains to your sketch as you see in the Constrains window on the left. Click on Close to exit the Sketch. You can now extrude the sketch to a three dimensional object. 1. Select the Pad command under the Task section in the Combo View. 2. Set the length to 60mm, the tab to Dimension and uncheck Symmetric to plane and Rewind. Length will determine how far your object is extruded. The option Rewind will extrude the sketch in the other direction. 2nd length will be enabled by switching the Dimensiontab to two dimensions and will extrude the object on two sides. Confirm by pressing OK.
You can also move the object around and take a look at it from different sides. 1. 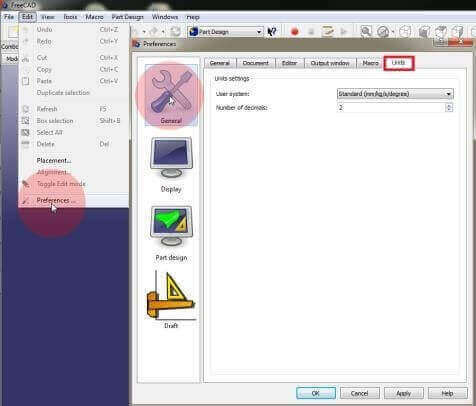 Holding the middle mouse button and moving your mouse will move the object. 2. You can also select different angles of view. 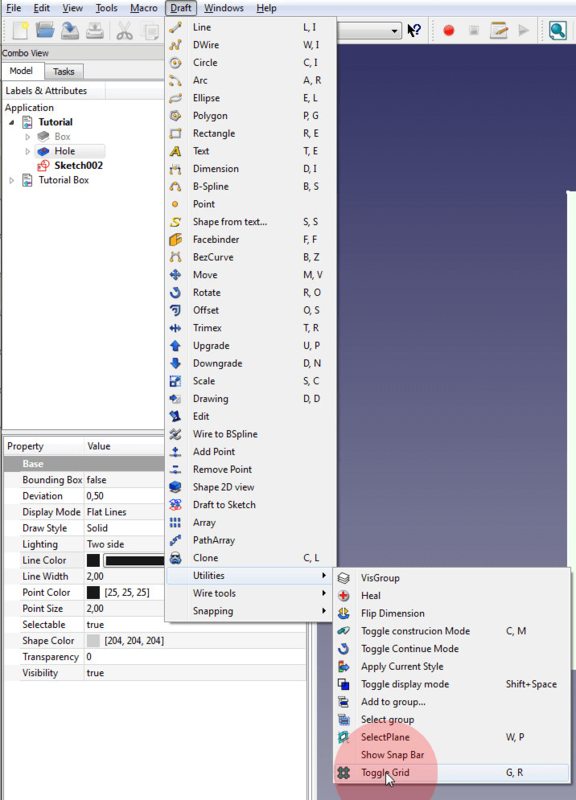 The different views can be found right in the middle of the FreeCAD toolbar. The axiometric view projects the object in a three dimensional way. You can also choose to look at one specific side. 3. When you lost track of your object press on the magnifying glass on the left of the view toolbar. This will center your entire project. To begin with Lesson 2 of this FreeCAD tutorial, open the last lessons project and switch your Workbox to Part Design. At first, we want to hollow out our box with the cut feature. 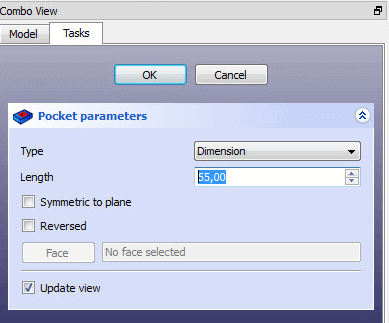 Set the dimensions of the Pocket feature found in the combo view. 1. Select the Top plane by switching to the Top view in the view menu and clicking on the visible face of your box. Now create a new sketch under Task in the Combo view window. 2. Set your grid to 5mm and check Grid Snap. Now draw a rectangle starting at -35.0, 35.0 and make it 70.0 x -70.0 big. It should offset 5mm from the edges of your box. Click to confirm the rectangle and close the sketch. 3. Go on by clicking on the Pocket feature right under the Pad feature in the combo view. This feature will cut everything inside your recent drawn rectangle. You can change the direction and the limit to cut to in the Type selection. Set Type to Dimension and your length to 55.0mm so the floor is 5mm thick. Also rename the created pocket to “Hole” by pressing F2. When you switch to isometric view you can see the hole in the box. Set the Draft Plane on the top face of the box. 1. To keep the future lid in place, you will have to create a rim around the top of the box. Switch to the isometric view and select the top plane of the box again. Do not select the floor or walls of your box! 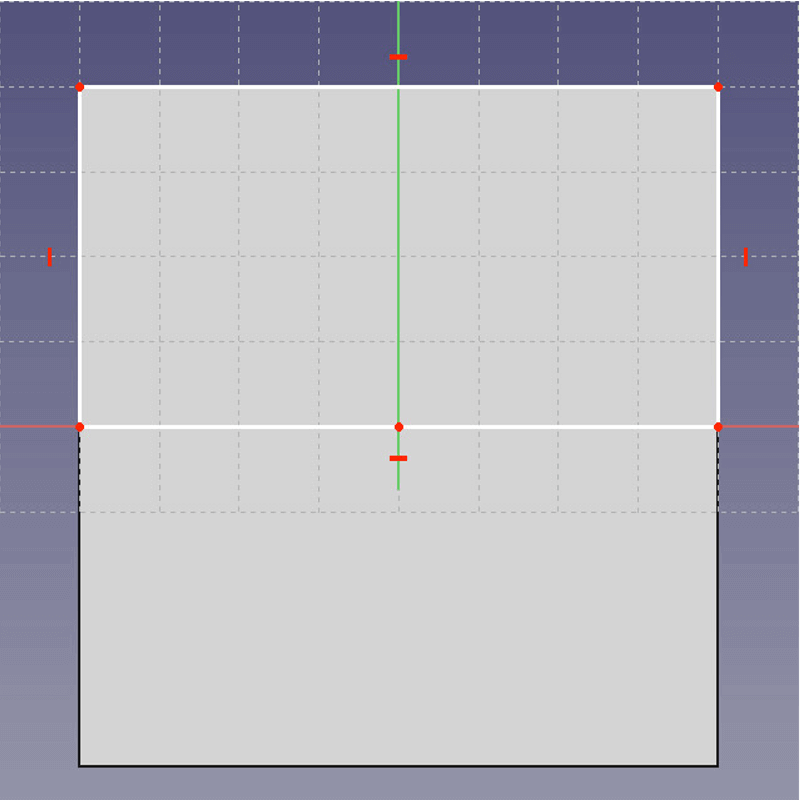 Change the grid size to 5mm and enable grid snap. Now create a rectangle aligned with the top edges of your box starting at -40, 40.0., close the sketch when finished and rename the finished sketch to Rim 1. To access the Offset tool switch your Workbox from Part Design to Draft. Disable draft grid after you finished drafting. 2. Redefine your working plane by clicking on Set Working Plane and then on the the top plane of your box. A grid should become visible. To show or hide the grid go to Draft > Utilities > Toggle Grid. The height working plane will determine the drafting level. Drafting on different levels will allow you to extrude the drafts into one object. Offset “Rim 1″ to the center of your box by -2,5mm. Be careful not to move your cursor. 3. 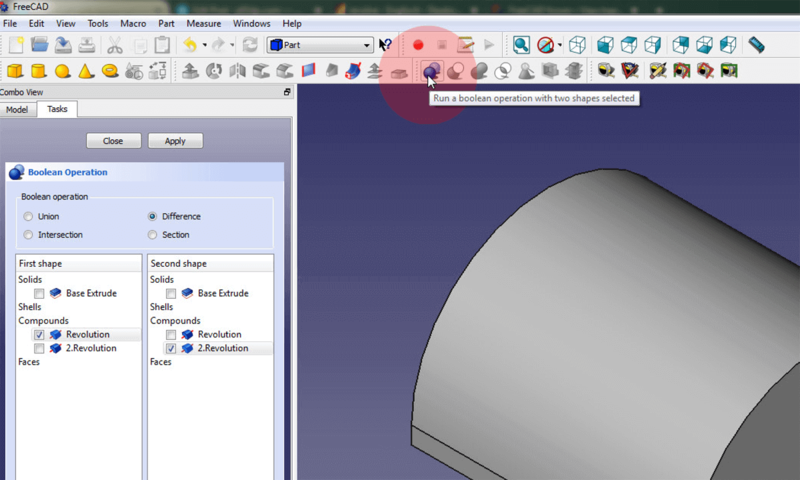 Select the sketch “Rim 1″ in the Model section and select under Task the Offset tool. Check Copy so “Rim 1″ remains after the offset. When using the offset tool it is very important to move and keep your curser in the modeling window. You will notice a rectangle following your curser. Now do not move your mouse, type -2.5 and press enter. This will offset your sketch by 2.5mm to the inside. Also rename “D Wire001″ to “Draft”. 4. Disable your Draft grid as shown in 2. and switch your Workbox back to Part Design. Sketch a rectangle on top of the draft. 1. Double click on “Rim 1″ sketch to edit it. Set your grid to 2.5mm and check grid snap. Now draw a second rectangle right on top of “Draft” starting at -37.5, 37.5 and close the sketch. Now you can also delete “Draft” by clicking on it and pressing the delete button. 2. Select “Rim 1″ again and cut it by using the Pocket feature. Set Type to Dimension and Length to 5mm. This will cut the space inside the rectangles. In lesson 3 of this FreeCAD tutorial, you are going to learn how to multiply a part and make corners round. To begin open the box you created in lesson 2. Create a circle on the bottom of your box. 1. The Pattern feature distributes an object equally. So before you can pattern an object you need to create one. In this step you are going to add little nubs on the bottom of your box.Switch your view to bottom view and select the visible plane. You should see the bottom of your box. Now create a new sketch on this plane and set your grid size to 5mm, also check grid snap. 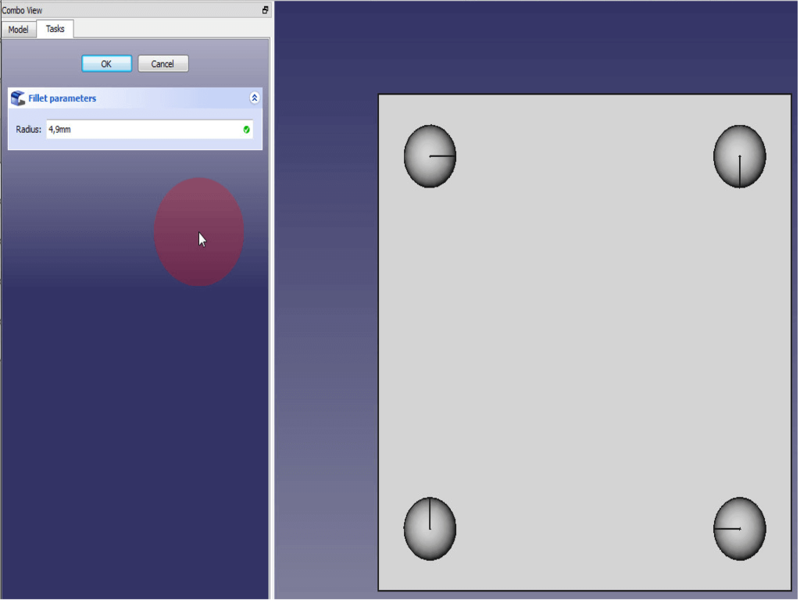 Select Create a Circle and draw a circle in the upper right hand corner of your box at -30.0, 30.0 with a radius of5mm. Now close the sketch. 2. Select the sketch drawn in 1. and extrude it with the pad feature. Set length to 5mm and uncheck Symmetric to Plane and Reverse. Press OK to finish and rename the Pad to “Nub” by pressing F2. First select the entity you want to multiply and then click on the circle pattern feature. This will arrange the circle equally. 3. Now click on “Nub” again and select thePolar Pattern feature. Set Angle to 360.00, Occurrences to 4 and uncheck reverse direction. This tool creates a circle pattern of a part with a specific angle and occurrences. The angle determines the size of your pattern. For example, at 360° the objects will be arranged in a full circle, at 90° only inside a quarter of a circle. With reverse direction checked your pattern will go around clockwise. Create a fillet from the circle pads with the radius of 2.4mm. 1. Switch to bottom view and select all the Nubs. To select many parts hold down CTRL and click on different parts. To unselect a part just click on it again. 2. Now select the Fillet Feature. The adjustable radius determines the size of your fillet. The radius has to be smaller than the entity you create a fillet so set the radius to 4.9mm. What you get looks just like little nobs. Close the feature and rename the Fillet to “Nub1″. First create a rectangle on the existing rim. Cut it by 2.5mm and then select the outward rim of your box to create a fillet. 1. Switch to top view and create a new sketch on the rim you created in lesson 2. Now draw a rectangle on the right side starting at 35.0, 37.5and make it 2.5 x -75.0 big. Exit the sketch and proceed to the next step. 2. Create a new pocket with the sketch from 1., set the length to 2.5mm and uncheck reversed. Also rename the pocket to “SmallRim”. 3. Now click on the outward edge of SmallRim and click on the Fillet Feature. Set the radius to 2.4mm. In lesson 4 of this FreeCAD tutorial, you will learn how to create a sweep out of two sketches and copy it afterward. To begin, open your Tutorial Box and switch your Workbox to Part Design. 1. Switch to your right side view, select the right side of your box and create a new sketch. Set grid size to 2.5mm and sketch a new rectangle at -35.0, 50.0. Make this rectangle 10.0 x -2.5 big. This rectangle will be the base for your sweep so rename it to “Hinge Base” by pressing F2. Create the semicircle following these steps. Move the sketch along the Y and Z-Axis. 3. When you switch back to right side view, you will notice that “Hinge Guide” does not align with “Hinge Base”. To move it right into the middle of your rectangle click on “Hinge Guide” and after that on the Data tab found at the combo view bottom. Click onPlacement now and then on the […] box to adjust the positioning of your sketch. Change the values in the Translation box. Set the Y-Axis to-30mm and the Z-Axis to 1mm. When using Translation the program will use the coordinates of your sketch as 0,0,0 reference. 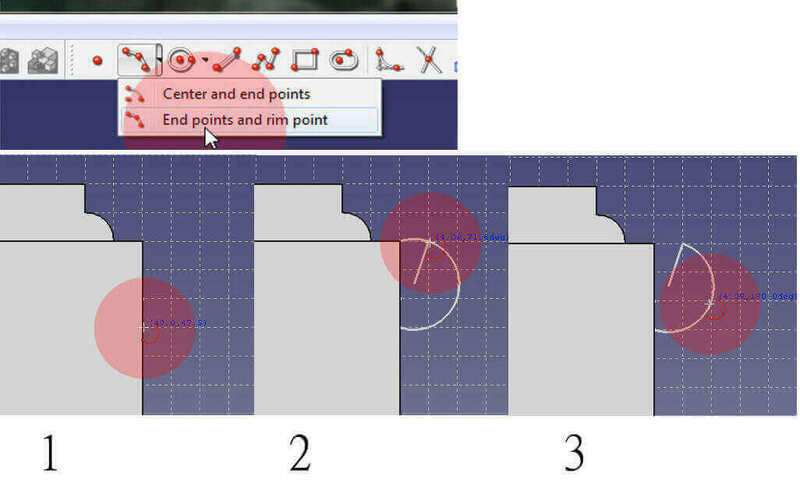 Using the Center values will use the overall coordinate system as a reference. Rotation gives you the option to rotate your sketch along an axis. Press OK to proceed. Select the Sweep Feature in the Part section of your Workbox. 4. Switch your Workbox to Part and click on ‘Utility to Sweep‘. This tool extrudes a sketch following a certain path. In the Combo View you can see all of your sketches. 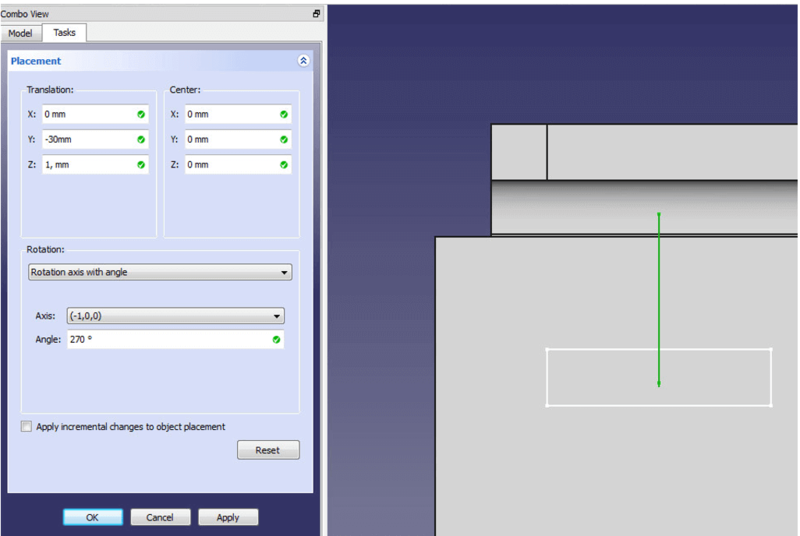 Select the sketch “Hinge Base” and move it to the Sweep box by clicking on the arrow facing to the right. Always follow this order when creating a sweep: Select the base > Click on Sweep Path and select the path > press Done and OK.
5. 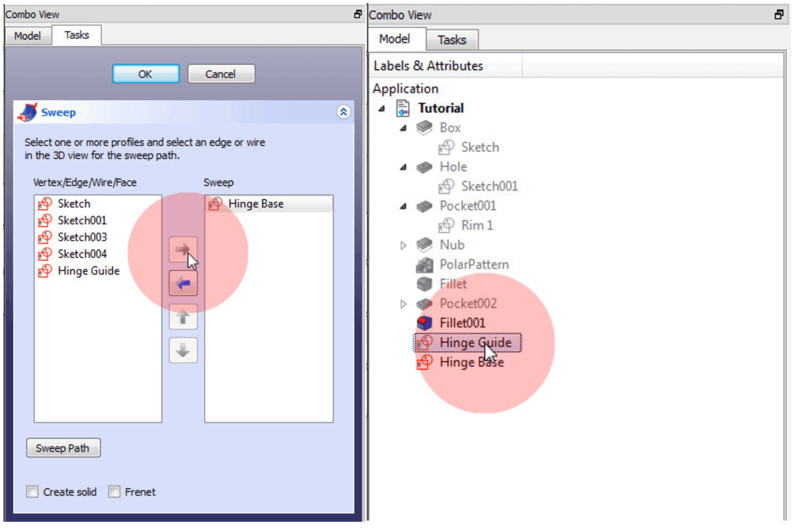 Now press Sweep Path and select in the Model Section “Hinge Guide” and switch back to Task. Confirm the sweep by pressing done first and then OK. Rename Sweep to “Hinge”. 1. Right click on “Hinge”, click on copy and confirm by pressing Yes in the Object Dependencies window. You can also use the shortcut CTRL+C. 2. Paste the object by either right clicking on “Hinge” again or pressing CTRL+V. 3. Now the copied object is right on top of the original. To move it, click on the Placement options as shown in Step 1,3. Move the object along its Y-Axis by 60mm. Now you have finished the box – congratulations! In the next lesson, you will create the cover for it. 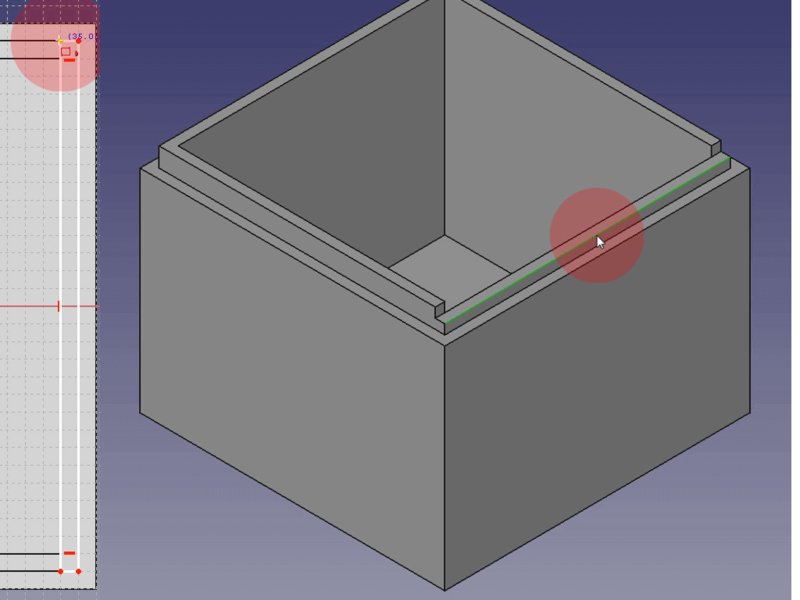 In lesson 5 of this FreeCAD tutorial, you will create the cover of your box. The cover will be curved and hollowed out with the Revolution feature. No, you are not going to overthrow any government but you will create a solid curved shape around a sketch. To begin open a new document and save it as “Box cover”. Then switch your Workbox to Part Design. 1. Create a new sketch on the XY-Plane, draw a rectangle starting at -40.00, 40.00 and make it 80.00 x -80.00. Rename the sketch to “Base”. Draw a rectangle on one-hal of your base. 2. Now extrude the sketch to 5mm height and rename it to “Base” also. When finished, start a new sketch on top of the extruded box. Draw another rectangle starting at -40.00, 40.00 and make it 80.00 x -40.00big. Rename it to “Base of Revolution”. Set Axis to Horizontal and Angle to 180° to create half of a revolution. 3. 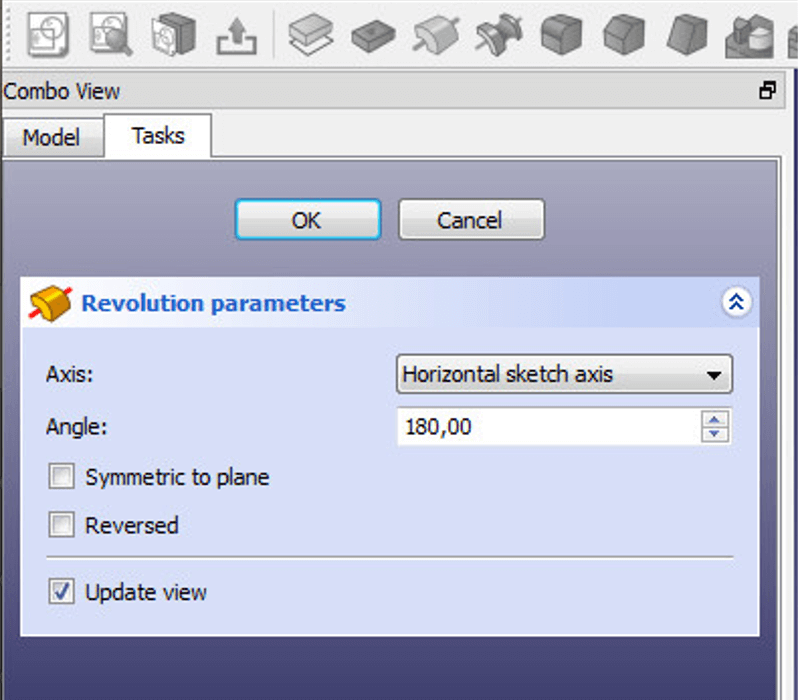 To create a revolution click on ‘Base of Revolution’ first and then on the Revolve a sketch feature. Set Axis to ‘Horizontal Sketch Axis’ and Angle to180°. Uncheck Symmetric to Plane and Reversed. Symmetric to plane will distribute the feature on each side of the sketched plane equally. Draw a second rectangle with an offset of 2.5mm to the edges on one-half of your box. 4. Hide the Revolution you created in 3. by clicking on it in the Model view and pressing spacebar. Now create a new Sketch on top of ‘Base’ extrude. Set your grid to 2.5mm and draw a rectangle at -37.50, 37.50 and make it 75.00 x -37.50 big. Rename it to ‘Base of the 2. Revolution’ and create a new Revolution feature. Rename it to “2. Revolution”. 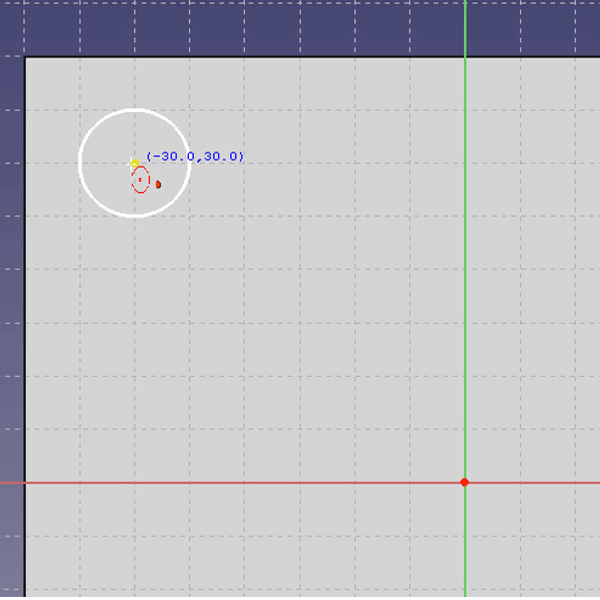 Set the Axis to horizontal and Angle to 180° also uncheck Symmetric to Plane and Reversed. Subtract with the Boolean command one object from another one. 1. Switch your Workbox to Part and select Run a Boolean operation. Check Difference in the Boolean operation window. This will subtract the Second Shape from the First Shape. Union will combine two objects, intersection will extract the common part of two objects and section will extract the common part of two objects as a non-solid. 2. Check as First Shape ‘Revolution’ and as Second Shape ‘2.Revolution’. Click on Apply to confirm the subtraction. 3. To finish we create a new sketch at the bottom of ‘Base Extrude’. Draw a rectangle starting at -37.50, 37.50 and make it 75.50 x -75.50 big. Cut the sketch with the Cut feature by a length of 5mm. 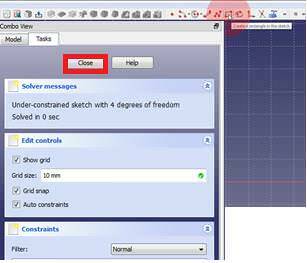 Congratulation on completing this FreeCAD Tutorial for 3D Printing! If you have any questions or problems regarding this FreeCAD tutorial, please do not hesitate to leave a comment. Also, if you want to add suggestions for this course, please use our feedback forum – thanks! License: The text of "FreeCAD Tutorial for 3D Printing" by All3DP is licensed under a Creative Commons Attribution 4.0 International License.